If you’re participating in Audiobook Week don’t forget to link up your reviews to the review linky. Confessions of a Sociopath takes readers on a journey into the mind of a sociopath, revealing what makes the tick and what that means for the rest of humanity. Written from the point of view of a diagnosed sociopath, it unveils these men and women who are “hiding in plain sight” for the very first time. Confessions of a Sociopath is part confessional memoir, part primer for the wary. Drawn from Thomas’ own experiences; her popular blog, Sociopathworld.com; and current and historical scientific literature, it reveals just how different – and yet often very similar – sociopaths are from the rest of the world. The book confirms suspicions and debunks myths about sociopathy and is both the memoir of a high-functioning, law-abiding (well, mostly) sociopath and a roadmap – right from the source – for dealing with the sociopath in your life, be it a boss, sibling, parent, spouse, child, neighbor, colleague or friend. At times M.E.’s story seems to contradict itself and I would be reminded that the narrator of this book self-identifies as a sociopath and wonder just how much I could trust her. Looking back now, I am not certain whether M.E. is a consciously unreliable narrator or if her lack of trust-worthiness has more to do with with a certain amount of self-delusion that is connected with her condition. I found the first third of Confessions of a Sociopath to be the most interesting part, particularly the discussion of the lack of recognition of risk and all of the rotten food M.E. has eaten because the threat of food poisoning is not a deterrent. I was also interested in M.E.’s childhood and fairly incredulous when she describes it as not having been so bad, when it pretty clearly sounds terrible to me. There is a point towards the end where the narrative begins to drag, particularly as M.E. begins to talk about all of her romantic conquests; that section goes on much longer than I was able to maintain interest. Of course, by that time I was pretty well invested in the book, so it wasn’t too big of a problem. 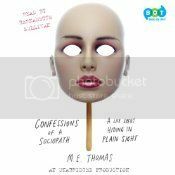 Bernadette Sullivan’s narration in Confessions of a Sociopath is not a delivery that would work in most audiobooks, but her dispassionate (although not without vocal interest) patter accentuates Thomas’s own style of writing and makes you truly believe you are listening to a sociopath tell you her story.